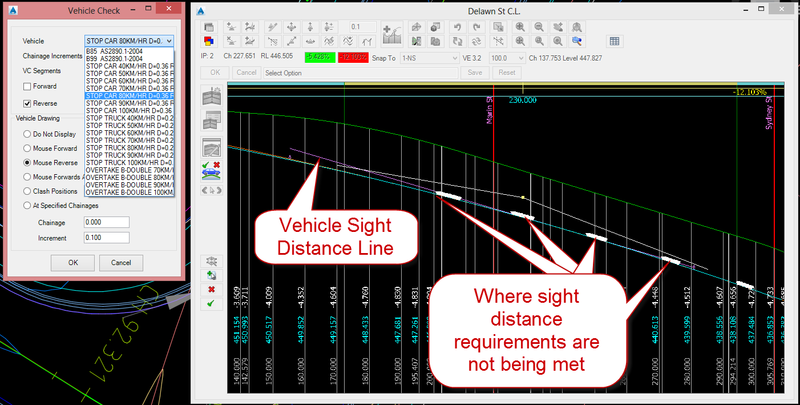 One of our users has intelligently come up with a method to check sight distance by using the Driveway Checking Tools within Advanced Road Design. Ross Macklin from Berrigan Shire Council has created some vehicle templates that allow him to check stopping and overtaking sight distance in the Vertical Grading Editor. This method will work well on straight roads with minimum bends. Calculations will not be as accurate on large horizontal curves. The templates have been created in accordance with the Austroads design manual. If you are interested in using Ross’ templates, than you can download the templates from the link below and add it to your Common-10 path (C:\ProgramData\CSS\ARD\Common\common-10). We recommend that you backup your existing Vehicle.shape.txt file prior to doing this, because this new file will override any vehicle templates that you may have created. When using the Driveway Checking Tool for Sight Distance checking, it is recommended that the Chainage Increments value is to 1. 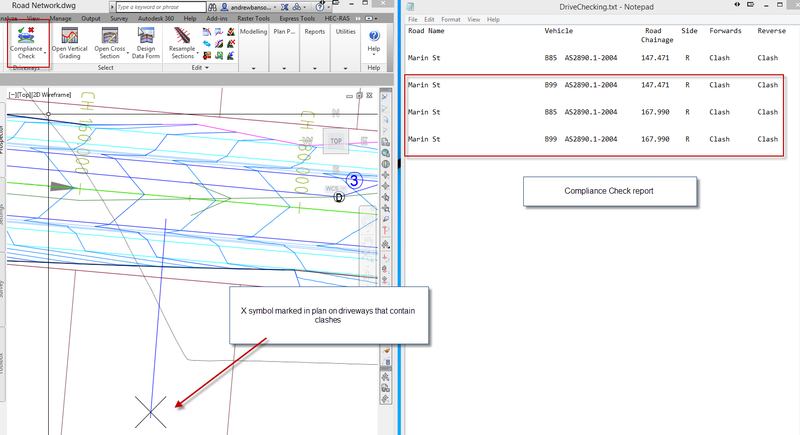 In Advanced Road Design V15.01, we have added a driveway compliance check report. This report will list all driveways created in the project and notify the user of any clashes occurring in a forward or reverse direction. Also, a ‘X’ symbol will appear in model space indicating driveways that contain any clash points. Traditionally in Advanced Road Design, bypass flows have always been calculated for pits, however for pipes, only the first pipe (from the top pit) had a flow that matched the pit inflow. On all other pits, the bypass was ignored and all surface runoff (excluding bypass received from upstream pits) arriving to the pit was added to the pipe flow, that is bypass was ignored. Two (2) other options are provided to better treat these bypass flows – Exact and Linear. These methods are the same, except for the time calculations. For larger networks, Linear should produce faster results because the user can enter the time interval. Specify the bypass setting in the Active/Global Network Settings. Selecting this method, the user is required to enter a time interval in minutes. The software will pre-calculate the bypass flows between the minimum and maximum times of concentration set, with the interval specified. As the bypass flows are pre-calculated, this method should produce faster results on larger stormwater networks. When this method is used, the exact time of concentration is calculated each and every time it is needed. With complex bypass and pipe configurations, this could result in some performance issues. Should this ‘lag’ be considered excessive to the user, perhaps the Linear method should be used. In both the Linear and Exact methods, downstream pipe flow is based on the Pit (Pipe) Inflow only plus any upstream pipe flow. 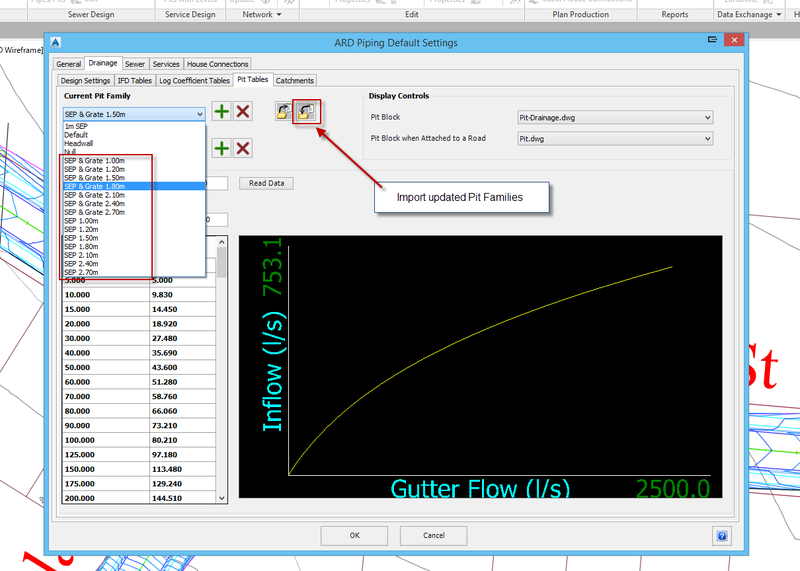 Bypass flows are sent to the nominated pit and may enter the next pipe based on that pits rating curve. This method is the original method for treating bypass and is applied to all stormwater networks. For the first (top) pipe of any branch that has surface flow only, without receiving any bypass flows, the pipe flow will match the pit inflow. On any other pit, all of the surface flow excluding any bypass flow received, becomes the adopted pipe inflow. Should the pit generate a bypass flow, this bypass flow is passed onto the nominated pit, however this bypass flow is ignored and forced into the pipe. That is bypass flows are ignored from the pipe’s point of view. This may produce a conservative pipe size for some and undersized on others. 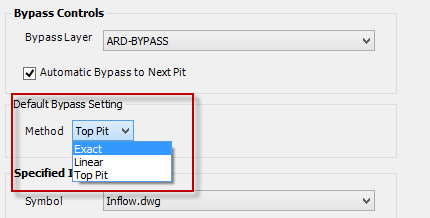 In the latest version of Advanced Road Design V15.01, we have updated our default pit database to include some new pit families. If you want to add these families for use in an existing design project, than you can download and import them into your project by following the steps below. The inlet capacity for these pits have been calculated using calculation methods available within Watercom Drains. We have been working on some new tools that allows users to quickly cut sections through a model. In Advanced Road Design V15.01, we have made available the command ARDUV7INDEXROAD, which allows the user to extract a section through TotalModel. To use this command, the user must create an AutoCAD Line object. Multiple Lines can be created in order to display multiple cross sections views. If the Line object is grip edited, than the cross section view will update. 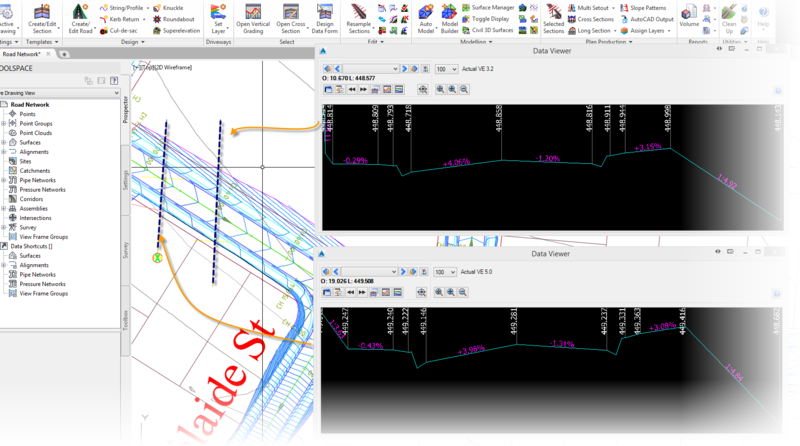 In Advanced Road Design V15.01, we have added a new command to the Vertical Grading Editor that allows users to add and edit their IPs in a grid format. When the Grid Editor is loaded, all IP’s will be displayed. These IP’s can be edited in the grid editor and the edit is instantly applied to the road or string. The user can override the chainage, level, and VC length and also quickly assign an elevation or grade difference between IP’s. We have created a collection of standard road cross section templates for users of Advanced Road Design in Western Australia. These include standard WA Main Roads templates along with templates used by local government.